Organic berries from Trinity Acres in Darlington. We do this thing over here. We have go to's. Local farms that we collect our amazing, fresh produce to fill our recipes. See how this works, fresh local foods, filling recipes, filling bowls, bellies and spirits. To have this option of driving down the road and round the bend, pulling into a drive lined with berries or other locally grown fruits and veggies, it is a gift. Berries are now in season. Our own Strawberry Festival is happening this weekend at the Historic Lane Place. Community coming together all because of that little red berry. It really is pretty amazing when you think about how all of this works. We have been jammin over here. Fresh strawberry jam filling up our kitchen. Jam count is at 102 jars! This week take a drive out to Trinity Farms in Darlington, In. Pick what you can use, slice them up and serve over a bowl of ice cream and sit out on the porch. We recommend. clean it up. Garlic Mustard. Our little sprites, Annie Mae and Lucy Bea are back at it this spring! 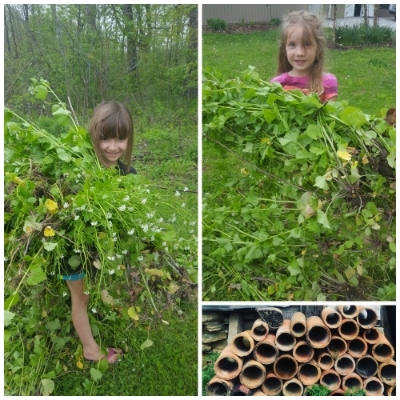 Protecting our land by plucking that nasty garlic mustard! Their seasoned hands and eyes are saving our little forest from this evasive plant. Garlic mustard threatens the forest by controlling the sun, soil and water, zapping the nutrients that other vegetation needs to grow and thrive. Because it monopolizes these nutrients, the supply is threatened and our forest needs those nutrients to sustain and be healthy. Our native plant and animal species are adapted to an environment rich in diverse resources. Invasive, non-native species like garlic mustard have the potential to destroy these habitats. Here you can read more about how to identify garlic mustard and why its presence has become one of the number one threats to our forests. This time of year we start getting a little more serious about the compost. Our garden is ready for a fresh mixture to help our seedlings along! Compost can be a bit tricky. It takes the right mix of "brown" and "green"matter, along with water to create the rich, dark result. Compost creates a more fertile soil. It helps Mother Nature nurture the process of growth. By creating a carbon/nitrogen ratio, you will get the pile cooking! It's just one big happy science experiment! water (H20) -- you want to dampen the pile. this gets those worms and microorganisms to do there thing! it to breathe and cook. Once the materials begin to breakdown, that is where you see the "black gold." The green and brown have worked together creating the compost! Mother Nature's original fertilizer!